After dealing with crowds and holiday shopping in RL and hunting in SL..oh and an inventory busting at the seams, I decided a drink and a smoke are just what I need! Plus it gives me an opportunity to wear one of my holiday outfits that I will probably never wear again! However, I already have about three pairs of black boots in SL so I just can't justify buying these too. 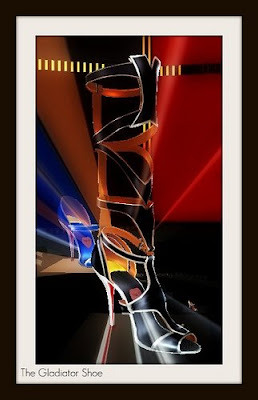 I did want to pay tribute to this beautiful shoe from Stiletto Moody though since I think it is such a piece of art. Back to My SL Job! So I am working back at Blue Fusion on Monday nights from 4-6SL time. It is kind of hectic because I literally walk in the door from my RL job and head straight to our office to log on to my SL job. Why do I do it...well because I like having spending money in SL and I hate putting too much of my RL money into it. Also, I was ready to get back into it after not working for the past four months or so. I really enjoy working with the DJ JamesLarkin and the customers on Monday night are a lot of fun! I was fortunate enough that they had an opening that worked out pretty good for me. I would prefer a 5-7SL shift but maybe one will open up at a later time. Anyway, I have been crazy obsessed with taking pics in SL and playing with them in Picnik and I have been taking some while I am at Blue Fusion too. I hope you likes! The following pics were taken today at our employee holiday party. Cen did a good post about growing old and what it means to her. I'm 40 in RL...yes there you have it my real age. You will never see what I actually look like in RL.. I have been tempted but telling my age is enough information. I am 40 and what I have learned about myself so far is this: I'm not a risk taker and I don't like change. I cherish comfort, safety and comfortableness (I don't even know if that is a real word?). I am an introvert and I need time alone to recharge myself. I think and analyze things so much that sometimes I can't make a decision. I am a homebody and I LOVE my home! There was a time there for about four months where being at home was not a place that I wanted to be at anymore and that was a terrible feeling! Where do you go when you don't want to be in your favorite place anymore? I think that is one reason why I like SL so much. It gives me chance to leave and go somewhere else without actually really leaving. I'm not that insecure around pretty girls anymore because I think I still look pretty good for my age. I know that may sound conceited but feeling insecure around pretty, cute or attractive women is something that I have always had a problem with. I hate to exercise and I hate eating right. I have been doing it off and on for the past 20 years and will probably still be doing it for the next 20 years. Things happen for a reason in life. We may not know it at the time but eventually it will be revealed. It may be years and years and years from now but things will eventually all fall into place. With all that said.....do I still have a lot to learn...hell yea! Am I comfortable in my own skin...hell no! Am I my own best friend...yes! Am I my own worst enemy...yes! With all that said would I go back to being 20? No, I like myself more at 40 then I ever did before. 1. One of everything from Zaara's clothing store. 2. One of everything from Zaara's clothing store in RL. Why don't stores like that exist in RL? 3. Unlimited prims on my land! Oh the things I could do!! /me rubs hands greedily! 4. Some type of skill that would help me to have a business in SL and would allow me to be creative. 5. Time to organize my inventory! 6. Things to rez quicker for me in SL! Hi, Here is my submission for Ali's challenge. You can barely see them but I am wearing snowflake earrings and a snowflake necklace! I know the hump day parties are on hold for awhile but I had a suggestion for something that we may want to think about trying when they come back. Since the point of the parties is to socialize and have fun, why don't we randomly pick a club to go to each Wednesday night or one or two Wednesday's of the month. There are so many clubs out in SL that we could explore and try out. One Wednesday we could decide to all dress up and go to a jazz place and then dress up rocker style and go to a metal club, etc., etc. I am sure the clubs would love the traffic and we could see more of SL and share some of our favorite spots. I won't be able to go to any of the hump day parties until AZ time matches up with SL time again but I wanted to put in my two cents.